Only 6 left in stock - Order today! The Riedel Stemless O Wine Glasses are the newest revolution in glassware. Casual yet elegant, these wine glasses are appropriate for fine wine enjoyment, as well as casual sipping. The wine tumblers were shaped to fit into a dishwasher and fine-tuned to enhance the pleasure of your favorite wine varietals. Riedel Special! 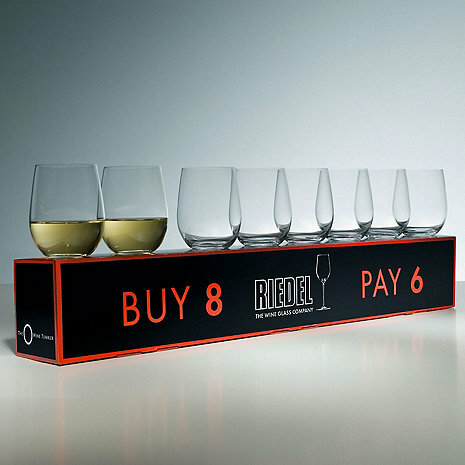 Buy 8 Chardonnay/Viognier stemless wine glasses, pay for only 6! The Riedel Stemless O Wine Glasses are the newest revolution in glassware. Casual yet elegant, these wine glasses are appropriate for fine wine enjoyment, as well as casual sipping. The wine tumblers were shaped to fit into a dishwasher and fine-tuned to enhance the pleasure of your favorite wine varietals. In keeping with the Riedel glassware tradition, these wine glasses have become the benchmark for stemless glassware. Machine made in Germany of lead-free crystal. Gift boxed. Dishwasher Safe. Size: 3-7/8"H x2-1/2" Dia., 11-1/4 oz. What is the difference size-wise & capacity between the "O" Chardonnay (stemless) & the "O" Viognier/Chardonnay (stemless)? BEST ANSWER: It is the same glass, sorry for the confusion. Sometimes it is called just chardonnay and sometimes chardonnay/viognier. How many ounces does the Chardonnay stemless wine glasses by reidel hold. We love these glasses, perfect size for everyday use, fit easily in the dishwasher. Usual excellent Riedel quality, good value. Bought these for a wine tasting with my friends. Haven’t used them yet but know they will be fine. Shipment packing needs improvement given the fragile nature of this crystal. I'm so happy with these glasses. Very nice weight and excellent quality. I have a personal preference for stemless glasses; that aside, these high quality glasses enhance any wine. These glasses are great for us for casual use. Great for the wine, great for us, and great for the dishwasher. Would definitely recommend these.